You may have the problem that some uninteresting images or posts are showing on your Facebook News Feed. You have the option to hide some type of posts from specific person, website, group or page. Just click the arrow in the top right corner and you have many choices like: I don't want to see this, Unfollow, Hide all from specific website, Save for later or Turn on notifications. If you want to see a person that you have unfollowed go over News Feed and click on Settings icon> Edit Settings. Remove the friend, page or group from the list and you will see it again. If you need another view of your News Feed you can always change the setting from the left column and select Top Stories or Most Recent. With Top Stories you will see the most popular posts and the posts you interact with the most. With Most Recent you will see the same posts, but in the order they were posted. 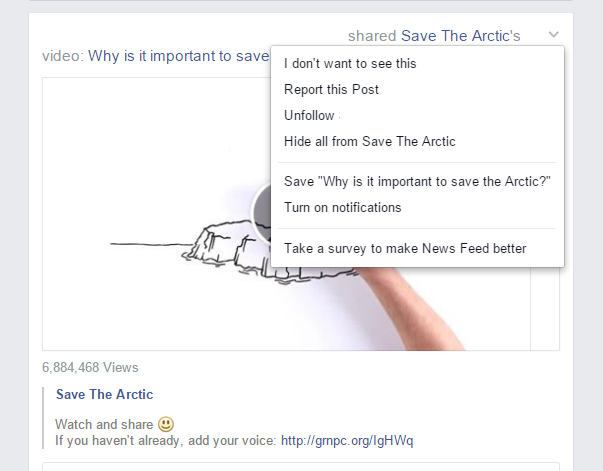 You may watch the video if you need more information what's new on the mobile version of the News Feed.